There is something so vitally enriching about moving and breathing with hundreds of other souls with a common goal in mind, peace. 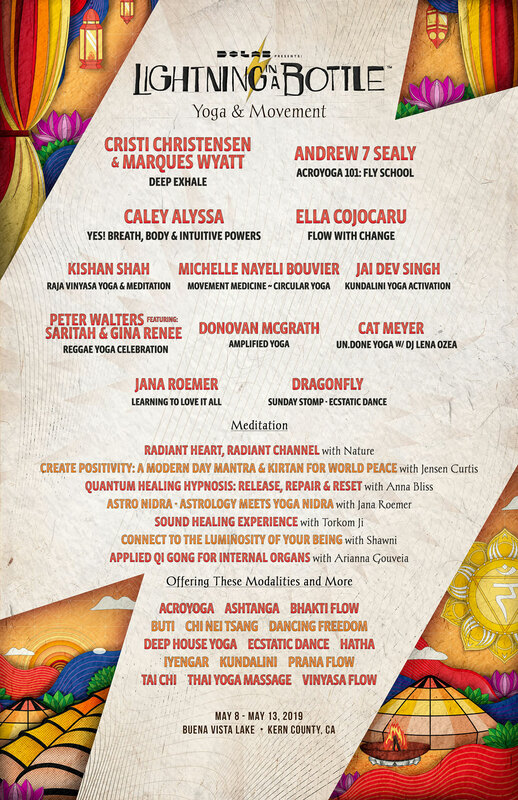 One of the final pieces to the Lightning in a Bottle experience has come together – the Yoga & Movement lineup. This transformative festival, based in California, fuses many forms of yoga, unique mediums of art, groovy dance music, and advantageous education into one incredible event. This festival is praised for bringing some of the most well-known yogis to guide each class in a way that lifts the spirits of all in attendance. The 2019 Yoga & Movement lineup includes Acroyoga 101: Fly School with Andrew 7 Sealy, Kundalini Yoga Activation with Jai Dev Singh, Reggae Yoga Celebration with Peter Walters, and Ecstatic Dance with Dragonfly, to name a few. In previous years the meditation tent has been packed from sunrise to sunset with the luminous sounds of mantra chanting, breathing in life to all who passes by. The guided meditations should be on every attendees’ radar. The themes for this year’s meditations include Radiant Heart, Radiant Channel, Create Positivity, Astro Nidra: Astrology Meets Yoga Nidra, Connect to the Luminosity of Your Being, the beloved Sound Healing with gongs, and many more. All who are attending LiB this year should challenge themselves to step outside their comfort zone and enjoy the benefits of yoga, meditation, and unified breath before diving into the long nights of dancing. The experiences offered at LiB will bring guidance, self-awareness, and renewal to all who come with an open mind and an open heart. Tickets for Lightning in a Bottle are available on the festival’s official site.